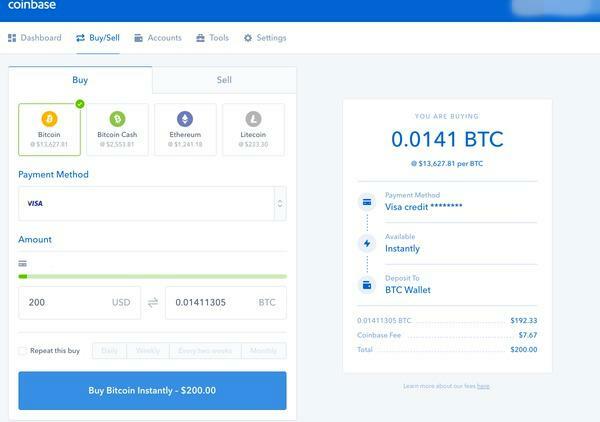 Coinbase is a popular site because it is fairly easy to use. New users can expect delays in getting started as the company struggles to overcome a backlog of new customers. Coinbase reported 11.7 million users in October 2017, that is more than Charles Schwab with 10.6 million active brokerage accounts. For context, Schwab has been around for decades, while Coinbase launched in 2012. 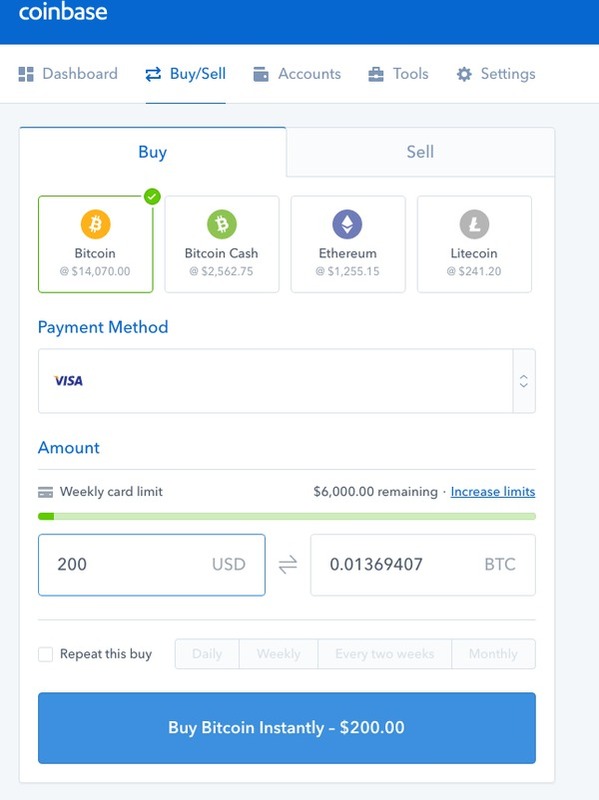 A minimum account size is not required at Coinbase; you can buy bitcoin at Coinbase and then ship it to your private wallet, leaving a zero account balance at Coinbase if you like. Perhaps the safest way to hold bitcoin is in your own private wallet, in case the exchange gets hacked. You will need valid identification, such as a drivers license or photo ID. Some exchanges require a selfie of you holding your identification card. You will upload your ID directly on the Coinbase website. For security purposes, Coinbase does not allow you to send your ID by email. You need a bank account or credit card. 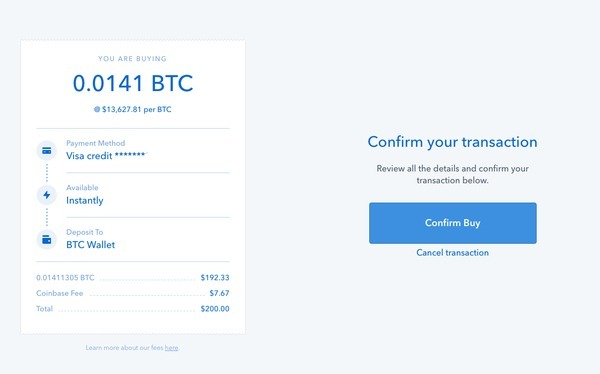 During due diligence, Coinbase will send a few pennies to your bank account, then you must verify the amount to Coinbase. All this is for verification and authentication purposes. Like any bank or money transmitter, Coinbase must comply with Know Your Customer/Anti-Money Laundering laws. 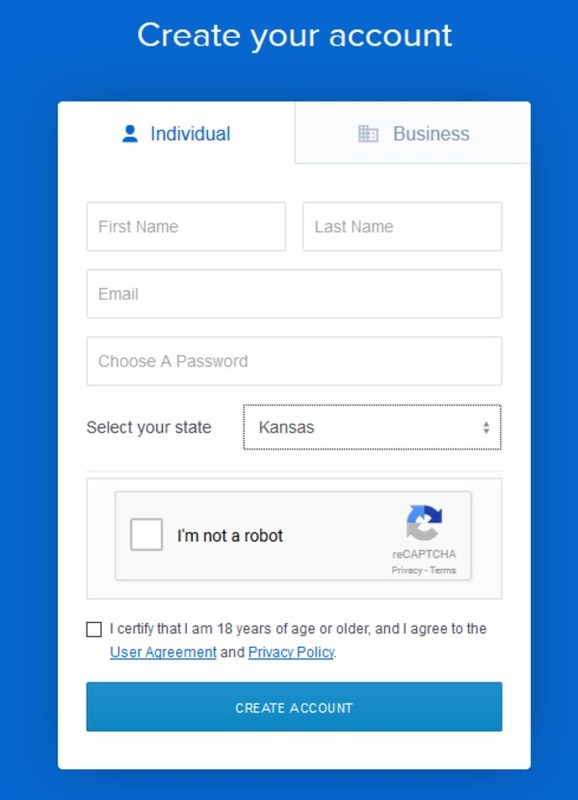 Simply fill in the required fields to open your account. You will be prompted to upload your ID and verify your bank account or credit card as you go. Simply follow the prompts as they appear to complete account set up. 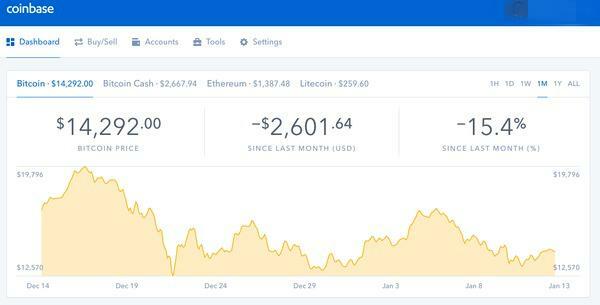 Once you have opened an account at Coinbase, you will see its dashboard with the price of bitcoin, Ethereum, and Litecoin, along with a chart of bitcoin. 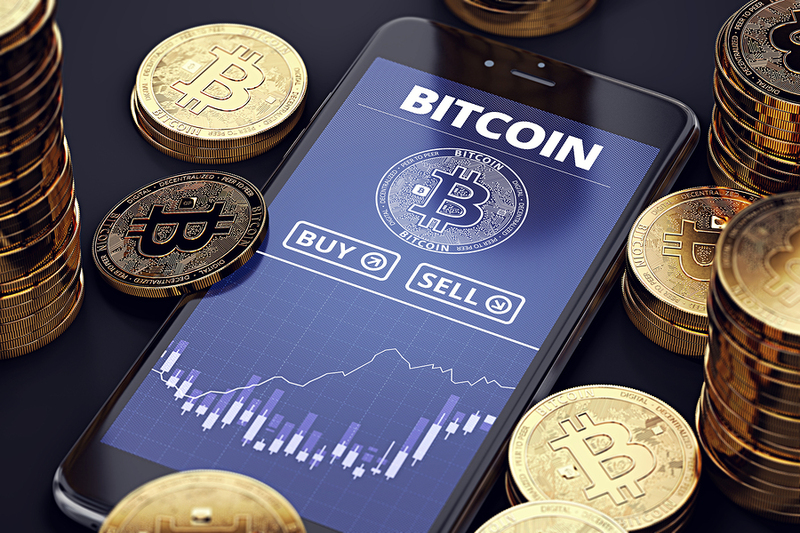 You can specify a dollar amount of bitcoin you want and the website will display the amount of BTC you would receive for that amount. In this case, the purchase is for $200 worth of bitcoin or 0.01369407 BTC. 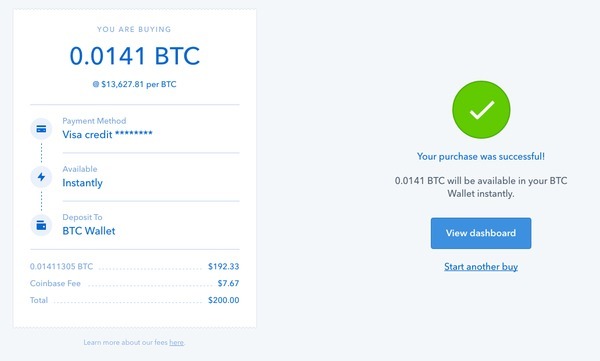 You will see the order to buy 0.0141 BTC for $200, with a $7.67 Coinbase fee, which is 3.8 percent of the purchase price. The price of bitcoin was $13,627.81 at the time of the sale. Hit “Confirm Buy.” Then you will see a green check indicating the purchase was successful. One approach to buying an investment with a fluctuating price like bitcoin is dollar cost averaging. 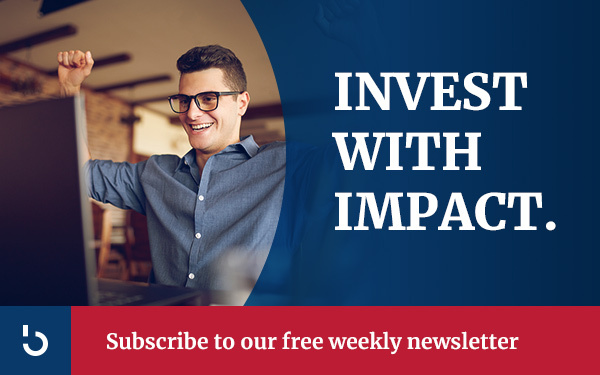 Dollar cost averaging is buying a fixed amount every month to average in your cost basis. Dollar cost averaging works well for investors who are buying stocks or cryptocurrencies on a fixed monthly budget. Coinbase allows you to set up this kind of recurring transaction straight from your dashboard if you wish. Simply check the “Repeat this buy” box on the Buy/Sell page and choose the frequency of your recurring purchase. Coinbase is a good way to get started with buying bitcoin and altcoins because of its ease of use. It also offers sales of Ethereum, Litecoin and Bitcoin Cash. Yet Coinbase has limitations. It is so overwhelmed with new customers, it takes awhile to get approved for trading on its site. Secondly, Coinbase does not offer Ripple XRP or several other popular currencies like Dash. A review of other crypto trading sites can be found here. The market is huge, with about 1,400 altcoins currently. To keep on top of this fast-changing market, subscribe to the Bitcoin Market Journal newsletter today!